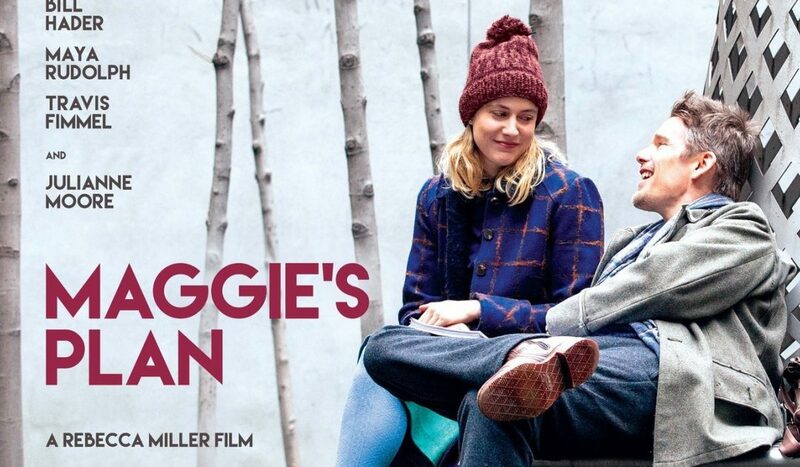 Directed by Rebecca Miller and released in Ireland on 8th July 2016, Maggie’s Plan raises the question as to whether the need to control others is an individual personality trait or an encompassing human one. The off kilter comedy set in New York is often sobering alongside the sun spots, with absorbing performances from Greta Gerwig, Ethan Hawke, Bill Hader and Julianne Moore. The audience’s established affection for Gerwig following her performance in Frances Ha (2013) is supported by a voyeuristic commentary on the contemporary human experience. The portrayal of idealized adulthood plans gone awry is familiar, made distinctive through Maggie’s misguided attempt to face ‘the truth about herself’ through fervent micromanagement of her familiar’s social choreography. In a whistle-stop opening we are introduced to her original plan whereby Maggie is determined to have a baby, aided by way of a friendly donation from Guy the ‘Pickle Entrepreneur’; a character whose only real flaw is a complete misinterpretation of personal space. However the carefully planned procedure is interrupted by brash proclamations of love, rewriting Maggie’s need to make external human relationships ordered through planning. Almost immediately an ill-advised and impulsive extramarital love affair springs between Maggie and John, one of the bad boys from ficto-critical anthropology, as portrayed by Ethan Hawke. Miller then opts to fast-forward through the rose-tinted honeymoon period that follows, with the narrative resettling three years later. The couple have established a semi-idealistic albeit mildly delusional situation, largely as a result of the classic inclination to demonize all that threatened their union. In quickly seeking a liberal partnership they leap beyond all social preliminaries and end up far from either of their real dreams, and even farther from admitting it. Just as Maggie had been courted by the chapters of John’s never-ending and far from realized great novel, the novelty of their fresh affections are quenched by unappealing reality. Far too soon are the couple trapped in the mundane tide and must face the notion that love doesn’t work that way “you can’t take everything and stuff it back in the box”. From over-emotional preliminaries and the backing track of John’s second marriage quietly crumbling, Maggie is compelled to launch a new phase of her plan in order to achieve her contradictory ideals and ‘live truthfully’. Just as Maggie had described John’s novel as screwball surreal, the account becomes increasingly apt for the film itself. The very dynamic she sought to liberate John from in his first marriage now appears to be exactly what is prescribed for their own union, verifying the cliché that every relationship has a rose and a gardener. For a time it seems as if there is no happy ending in sight, with a cosy lifestyle gone lukewarm, a suggested repercussion of wise advice once ignored. Thankfully this is not the case and a new plot, inspired by a joke, sees Maggie team up with John’s eccentric ex-wife played by Julianne Moore. A combined effort is required as Maggie and Georgette’s covert scheme seeks to readjust John’s affections. Meanwhile he remains oblivious and merely flirts with reality through his writing, adjusting his character portrayals as needed in order to reaffirm his choices. However every scheme exists to be unfurled, and with realization of Maggie’s need to dictate reality comes a dial-down of vibrancy. Once paired with academic idiom that references commodity fetishism, Miller’s film serves as a larger commentary on the fetishization of grand romantic gestures as generic solutions. Throughout the bumbling yet charming plot the audience comes to recognize that true affection is often miraculously ill-timed, and possibly always spurred on by hot whiskeys and classic Bruce Springsteen. Maggie’s Plan portrays collective contemporary frustration at the individual’s inability to create things in their own vision, incorporating notions of overwhelming self-interest alongside a suggestion that lovers of math are drawn to those who are calculating. Overall it makes space for progressive partnerships that can ultimately succeed, leaving room for the naked portrayal of the flawed character with good intentions.